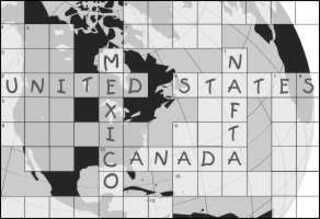 Prior to NAFTA's actual implementation in 1994,3 the U. S. Federal Reserve Bank of Chicago estimated the agreement would produce "output gains" for all three nations, increasing U. S. gross domestic product (GDP) by 0.24 percent, Mexican GDP by 0.11 percent, and Canada's GDP by 3.26 percent4. As President Clinton reported during his May 1997 trip to Mexico, by the end of 1997 the historically "Third-World" country would buy more American products than any country except Canada, surpassing even Japan, which has an economy 15 times larger than Canada. In fact, during NAFTA's first three years, 39 of the 50 states increased their exports to Mexico, with 44 seeing a rise from 1995 to 1996.6 Over the same period, U. S. exports to Canada rose by 33 percent. There is also the issue of jobs, about which estimates and studies vary widely. Shortly after NAFTA was signed, the office of the U. S. Trade Representative announced that NAFTA had created 122,000 U. S. jobs as a result of trade with Mexico, plus 189,000 due to Canada, totaling 311,000 jobs in all.10 On the other hand, a study by a coalition of labor union and environmental groups led by the Economic Policy Institute, contended that NAFTA had cost 420,000 American jobs.11 By mid-1997, the U. S. Department of Labor certified 116,516 job losses. Whether any of this is true or not is impossible to tell. Therefore, some skepticism regarding estimates of NAFTA-related job loss or creation is warranted. The authors avoid making estimates or devising their own formulas, instead citing only the claims made by others. Studies projecting NAFTA's state-level effects are scarce, which is not unusual for trade studies.15 One of the few conducted was done by the Pittsburgh-based Allegheny Institute for Public Policy. The study, which focused on NAFTA's three-year effect on Pennsylvania,16 found that the state's exports to Mexico and Canada reached record levels following the first full year of NAFTA's implementation, increasing by 31 percent and 11 percent, respectively.17 Of 30 Pennsylvania industries that do business with Mexico, 20 experienced export gains to Mexico in the first year of NAFTA, while 26 of 32 industries trading with Canada also saw increases. This led to an expansion of $616 million in Pennsylvania exports just after the first year. Among the key beneficiaries were capital-goods industries and the environmental-technology sector. None of the leading sectors in the state experienced notable drops in exports to either nation. Because of NAFTA, Pennsylvania-based companies like Heinz; Chester Environmental; Amp, Inc.; Mine Safety Appliances; and many more were able to expand their exports. For example, prior to NAFTA, Heinz had no sales in Mexico. By 1996, it had sold Mexico $3 to $5 million worth of U. S. products.